Just in time for the Christmas season, you'll have an opportunity to get into the holiday spirit with a free screening of Sing-Along Messiah in Toronto. The documentary film looks at the popular oratorio by George Frideric Handel as performed by the period-instrument group Tafelmusik. Their annual interactive performance in which the audience is invited to participate in the music-making began in 1986 and has been a Toronto tradition ever since. It is always a rousing, sold-out event, attracting about 2,700 enthusiastic audience members each show. 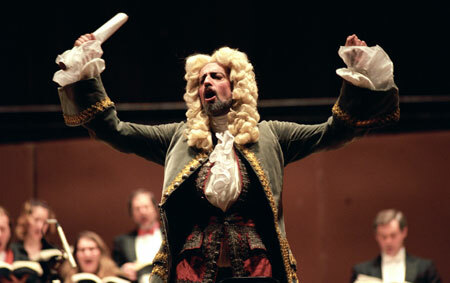 Choir Director Ivars Taurins usually conducts the concerts dressed up as Handel himself. The screening is this Thursday night at 7pm at the Regent Theatre, 555 Mount Pleasant Rd. The movie will air on the Bravo! network next month.